Featuring five-point harness openings, it can be easily adapted to both strollers and car-seats. 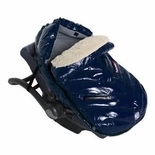 The hood zips down and can lay flat on the stroller or car-seat. The water-repellent shell protects children from snow, rain, and wind; Premium fiber insulation and a soft cotton lining provide ultimate comfort to even the youngest users. For warmer temperatures, when removing the snapped fleece blanket your igloo will be entirely lined with cotton. 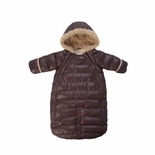 Made of the best outerwear materials and crafted with 7 A.M. Enfant's attention to quality and high-style, le sac igloo has become a favorite of parents around the world.